It’s been hailed as the best invention since sliced bread by its adepts, but also called a time consuming gimmick by naysayers. It’s a technique pioneered by Philip Stutcinskas and has widely spread beyond miniature armor model making. 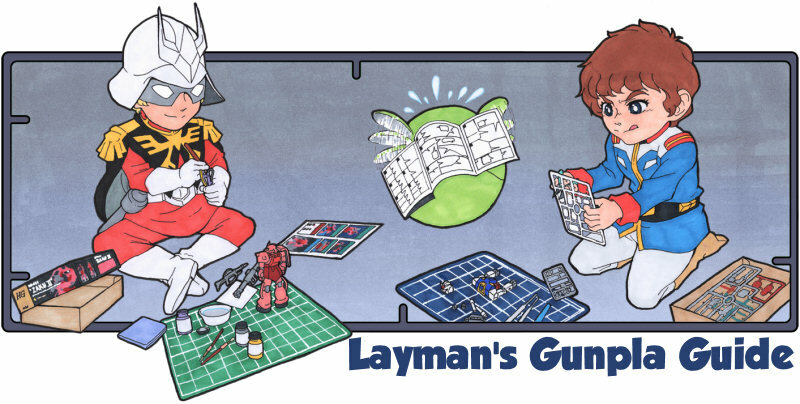 When it comes to gunpla, it is my opinion that there is no better technique for simulating paint chips that are scalable and hold up to macro-photography. It’s not necessarily the holy grail, but when combined with other chipping techniques it offers unmatched realism and control. 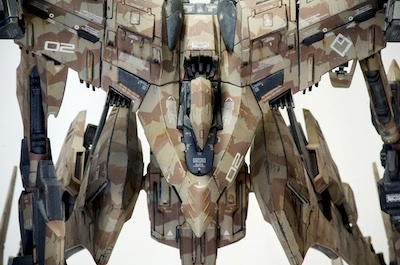 It qualifies as an “advanced” technique, which means it involves an airbrush and minimal skill with spraying paint in even, controlled coats. I wrote everything I could about the technique in a very long winded article because knowledge is power, but don’t worry, it’s not all that complicated! 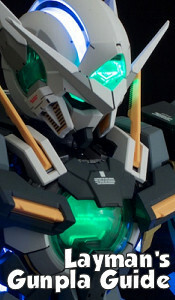 However, I recommend trying it out at least once on plastic scraps in order to become familiar with the process and avoid ruining an expensive kit. I did not succeed on the first try! Unlike dry brushing or pencil chipping techniques, hairspray chipping creates “true” chips: there are actual holes in the paint revealing another surface beneath. 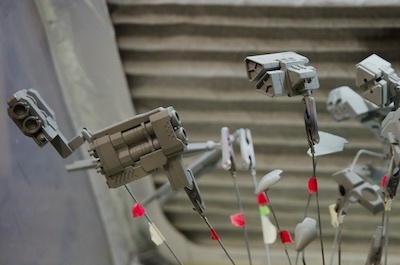 The process would be hard to recreate using brute force because physical damage to the paint often reaches too deep, resulting in scratches to the primer and perhaps the plastic. The idea is to weaken the topmost coat of paint with hairspray while having a hard shell beneath, which will remain unscathed. 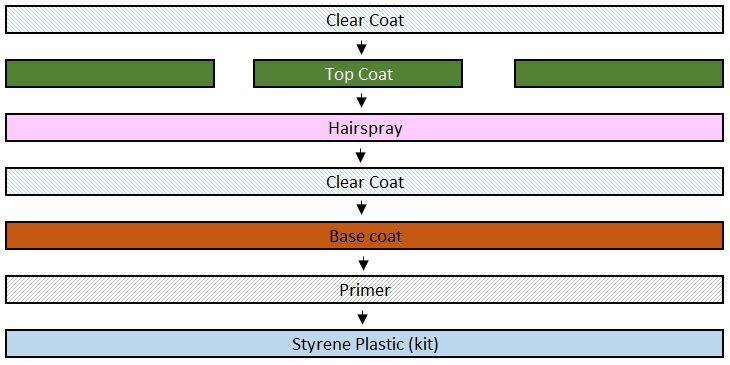 Here is a diagram of the layers involved in classic hairspray chipping. The “top coat” is not to be confused with a topcoat, which is a clear (transparent) coat applied on a part to change its finish from matte to gloss or vice-versa. Hairspray chipping begins with a primer and base coat. 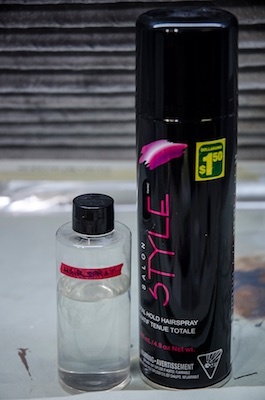 Since there is a certain level of physical abrasion involved, it’s important for the base coat to adhere well to the surface of the kit, which is why a primer is essentially mandatory for a successful hairspray chipping experience. Use your primer of choice; I use Tamiya white primer mixed 2:5 with Tamiya Lacquer Thinner, but this comes down to a matter of preference. Any hobby primer should do the trick, as long as it’s applied nice and smooth! You can find more on priming in general here. The color and finish of the base coat matter a lot. 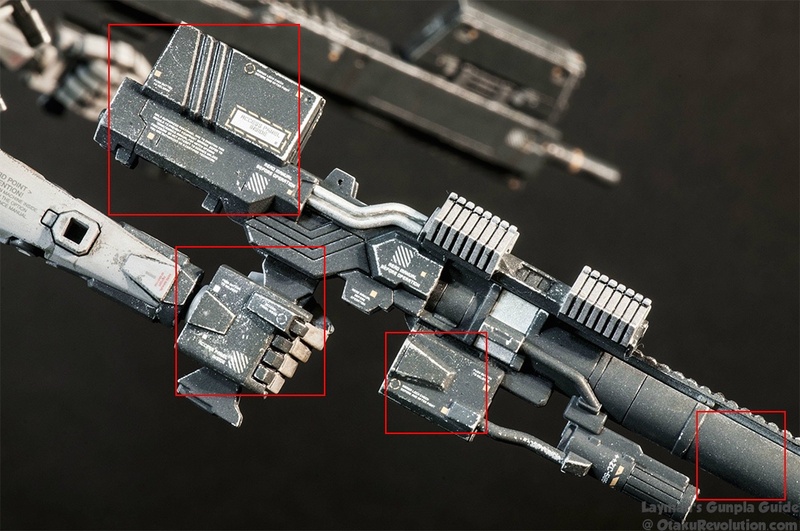 If the model kit is intended to be a rusted hunk of junk, your base coat should be rusty orange mottled with shades of brown. If you wish to reveal a non-rusted looking surface under the paint, grey paint is a wise choice. Using metallic paint as a base coat is to be avoided for several reasons which will be covered below. The color should be chosen so that there is a fair amount of contrast between the general color of the piece and the color of the paint chips. I choose a pale base coat for parts I intend to paint in a dark color and vice-versa: a dark base coat for parts that will be painted in a light color. If possible, using lacquer for your base coat is recommended. Lacquers have a harder paint shell, which means you are less likely to scratch through the paint in the next steps of the process. 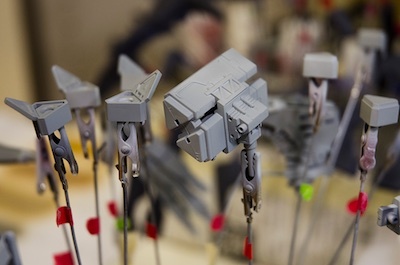 This also means that protecting the base with a clear coat is often unnecessary; too many coats of paint tend to fill up panel lines and round off small detail on a kit, so fewer coats are better. 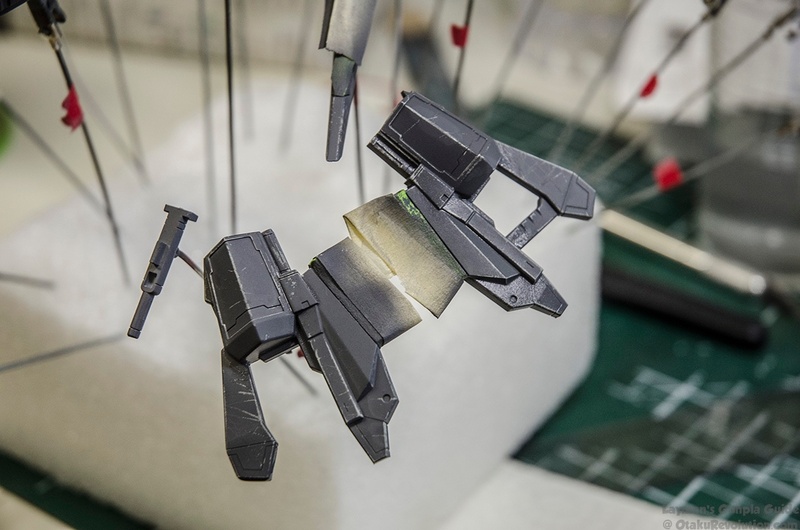 Still, if lacquer paint is unavailable, a good compromise is to spray Tamiya acrylics mixed 1:1 with Tamiya Lacquer Thinner; it sprays like silk and dries almost as hard as a lacquer! I know spraying acrylic paint with lacquer thinner sounds like witchcraft, but the official Tamiya USA website also recommends it! If you don’t want to deal with lacquer thinner at all, acrylic or enamel will do the job as long as it’s protected with a clear coat. Future/Pledge or other hobby clear coats will protect your base coat for the next steps. 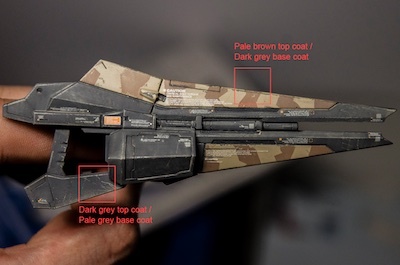 For the purpose of the basic tutorial, the pieces used as examples will be the ones featuring a dark grey top coat over a pale grey base coat. 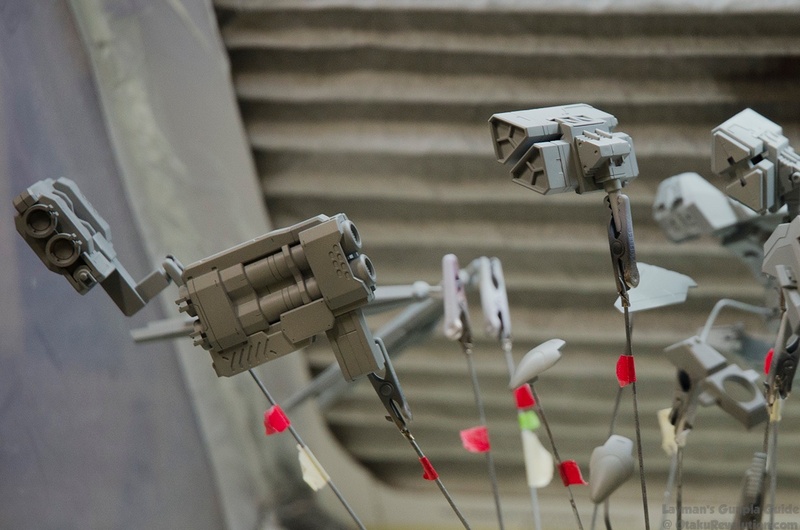 Here are some parts after being painted with a base coat of pale grey lacquer. 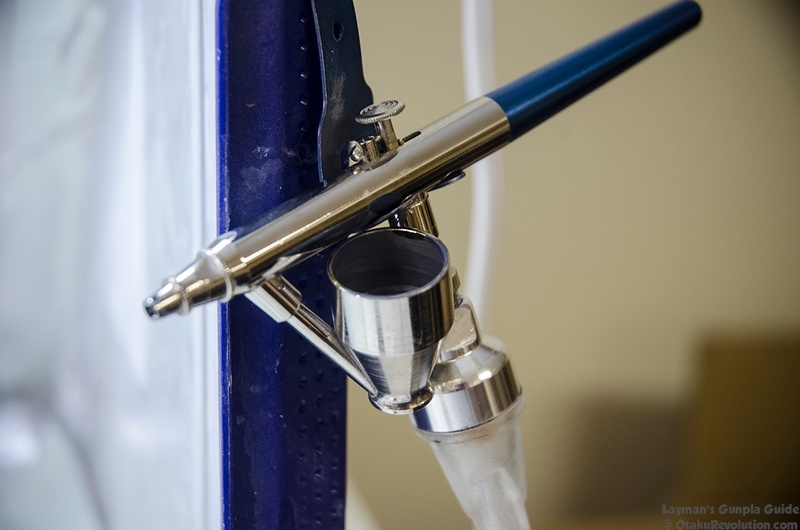 The level of glossiness of your base+clear coat will affect how the chipping process will behave: a matte finish will lead to smaller paint chips, whereas a glossy base will make the chipping step easier and will likely feature larger chips flaking off. While a glossy base is typically recommended, I have found it does not make a very big difference. Do as you wish! After you’re done painting let the base+clear coat cure completely for at least 24 hours. The next step involves covering each part with hairspray. Hairspray has many properties which make it handy for the chipping process. It’s essentially glue and denatured alcohol mixed together, which means it can be easily sprayed into an even coat and, most importantly, it’s water soluble. At least, the cheap stuff should be! For this purpose you want to get the cheapest bottle of hairspray available to you: water-proof hairspray will not work. Although hairspray usually comes in a rattle can, I don’t recommend spraying directly. Poor droplet atomisation and spray control may result in disaster, since denatured alcohol is a solvent for acrylic! Too much hairspray will melt your base/clear coat! For best results, decant the hairspray by spraying the can into a straw placed in a small bottle, which allows you to collect the product and store it for future use. More on decanting here! Use an airbrush to spray two or three unthinned, light coats onto every part. Let dry in between each pass. It’s almost invisible, tedious, but necessary! Let the coats dry for at least an hour after spraying. These parts have been covered in hairspray, although you can’t really tell. It’s now time to cover the parts with a color coat. This step must absolutely be done using acrylics, because they are softer and not waterproof until cured. I use Tamiya as a choice brand for this step, thinned in a 1:1 ratio with Tamiya’s own X20A thinner. Cover the parts with paint normally, as you would normally do right after the priming process. Try to keep the coats as thin as possible, spraying just the minimum needed to obtain coverage and color accuracy. Chipping a thick coat of acrylic is not impossible, but longer and harder. Let the acrylic dry for about another hour. Waiting too long (6 hours and more) will make the chipping very difficult. All this leads up to the actual chipping phase! To do this you will need clean water and some simple tools. 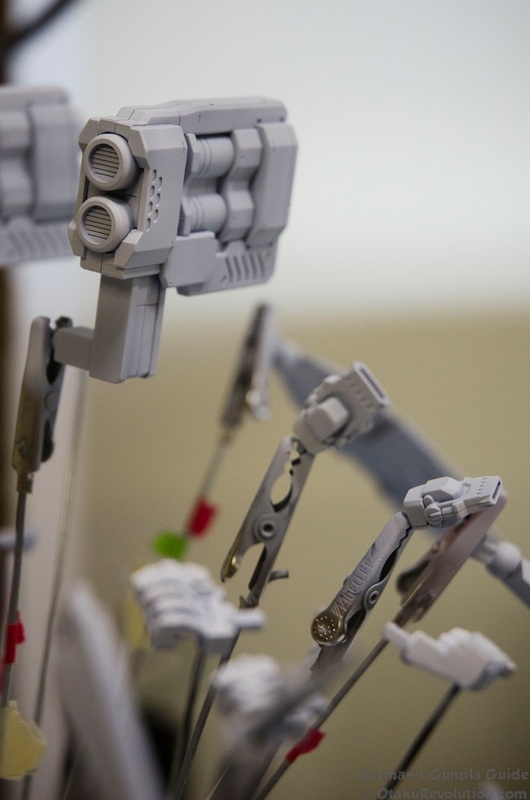 A toothbrush, a scrap piece of sprue and an old stiff brush will work wonders. Personally, I use a cheap toothbrush for most of my chipping work: it’s stiff and it offers a good level of control. To begin with, wet the surface to be chipped with water. You may even immerse it entirely. The water slowly seeps through the acrylic top coat and dissolves the hairspray underneath, which makes the top coat temporarily unstable. After 30 seconds or more, moderately vigorous brushing should start removing small chips of paint to reveal the base coat. Simulate line-scratches by scarring the top coat with a toothbrush or piece of sprue. This works best along the edges. Remove as much or as little paint as you wish, remembering that you’re trying to emulate physical wear and tear. Try to avoid overdoing it! The chipped top coat is very fragile after being thoroughly soaked, so you should set the parts aside to dry once you’re done chipping them. Eventually you’ll want to clear coat them again to seal and protect the fragile top coat. Pledge/Future is excellent for this. A glossy finish is also a good way to proceed, as it allows you to transition towards panel line washing and decals. 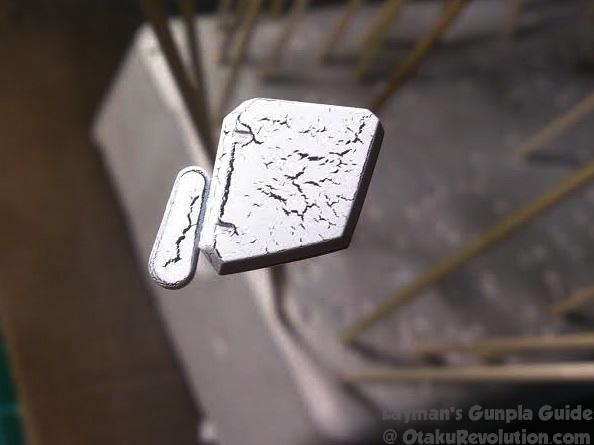 Keep in mind that while hairspray chipping looks good on its own, it should be combined with other techniques, chipping methods and weathering products for maximum effect! - Metallic paints are expensive, and covering an entire part in a metal finish just for 1-2% of the surface to show through a top coat is a bit inefficient. You’re better off using grey, which will end up being much cheaper and look almost exactly the same in the end! - Metallics don’t react well to being clear coated, and lose almost all their mirror shine after a single coat of varnish. 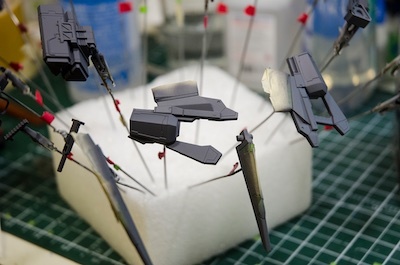 Is your kit going to be flat coated in the end? Forget metallics, since adding a flat clear coat will turn metallics into a dull grey. Of course, there is no absolute rule regarding to this and many builds have been successfully executed with a metallic base for hairspray chipping. Simply be aware that it may give disappointing returns. The chipping process has a lot of steps, and the drying time in between each step matters considerably. Insufficient curing time of the base+clear coat is the reason for the failure of my first attempt, as the denatured alcohol of the hairspray melted the dry yet uncured base coat. Give yourself some time! Starting the chipping process too soon after spraying will partially dissolve your top coat. The times listed above are important, and should not be skipped! Even if you’ve respected the drying times as above, sometimes the color top coat will appear “cracked” within minutes of drying. Inspect your parts for this if you can! This cracking happens when the hairspray is not dry enough, allowing the top color coat to slip and shrink during drying time, which manifests itself in the form of cracks. To prevent this, avoid applying too much hairspray, as a few light coats are more than enough. Give these coats enough time to dry, which can take up to two or three hours. Finally, the first coat of acrylic to go on top should be a light, fast-drying mist of paint rather than a thick coat. This will help with the adherence of a second, thicker layer of paint. Try to keep the acrylic top coat as thin as possible for easier chipping, but don’t hesitate to touch it up if you see it crack during drying time. It’s possible you end up removing too much paint during the chipping phase. It happens, and mistakes are inevitable. What I usually do is that I skip cleaning my airbrush once I’m done spraying my top color coat, and leave it loaded with a small amount of remaining paint. If I chip too much or a huge flake comes off a piece, I touch up the affected area with my airbrush. Bam, chip is gone! You won’t be able to chip that area with water again, so pencil or dry brushing chips will do the trick. Sometimes the water used for chipping will leave stains after drying. This is due to the minerals dissolved in tap water leaving residues in the form of tide marks. I panicked the first time I saw these! Don’t worry however: they will disappear completely when you clear coat the parts to seal in your top color coat. False alarm! Obviously, using distilled water will solve this problem, but I’ve stopped bothering. Tap water will do! Traditionally, the hairspray chipping recipe calls for hot water in the chipping process. Indeed, hot water will dissolve the glue in the hairspray much faster, allowing you to remove big chips right away. However, I like the fact that cold/ambient temperature water takes a certain time to soak in, meaning that the chipping becomes easier the longer I wait. That allows me to control how little or how much I chip a piece. Also it removes the hassle of keeping your source of water hot! But wait, there's more! If you haven't had enough on chipping make sure to check out the Advanced Hairspray Chipping Tutorial for even more tips.